ReLocate: Community Engagement and Solidarity :: Kivalina and Shishmaref, Alaska – Call For Civic Media Artist — Deadline: May 28, 2012. The Alaska Design Forum (ADF) is looking for an Civic Media Artist to join a group of social artists and scientists participating in our upcoming initiative ReLocate. 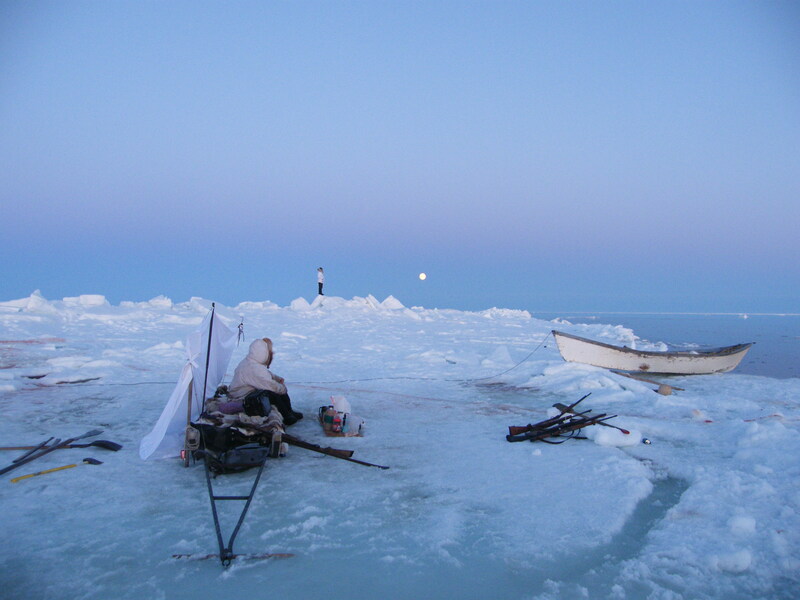 ReLocate is a collaborative initiative that develops venues for listening, solidarity, and engagement with the villages of Kivalina and Shishmaref in Northwest Alaska. Collaborating group members and community partners will design these venues to be launched during a two week gathering in the villages from August 21st to September 4th of 2012. Participating social artists and scientists include the Finnish architectural theorist Juhani Pallasmaa, Alaskan anthropologist Ann Fienup-Rioridan, the social artist group Wochenklausur from Vienna, and an interdisciplinary team of graduate students from the California College of the Arts Social Practice Workshop. This is a beginning, the ADF is shaping a context of intentions and building an infrastructure of cultural support. We imagine that concrete agendas and goals for these venues will develop through conversations between the civic media specialist, their collaborators, and community members before and during our visit. The ADF will host a symposium at the Anchorage Museum at Rasmuson Center for the review and discussion of ReLocate on September 7, 2012. The ADF is an arts and design non-profit based in Anchorage, Fairbanks, and Juneau, Alaska. We develop platforms for exploring relationships between local cultures, politics, and place in the state of Alaska. – The development of culturally specific and situational platforms that respond to local information sharing needs. – Technology and online architecture that supports civic engagement: Participatory mapping tools and spaces, mobile technologies for civic interaction, integrated platforms supporting diverse media, and community activated spaces for active civic participation and information sharing. – Collaborating with community members and multidisciplinary partners. You will work closely with Wochenklausur and community delegates in the months leading up to our visit, and during our time in the villages, to find appropriate online solutions for supporting and expanding project goals. – The social, political, and environmental context of issues surrounding village futures. – Opportunities for non-governmental partnerships and spaces that foster them. – Information sharing venues for the amplification of individual and consensual village voices and a community generated understanding of place. – A sense of locality defined by local notions of identity, worldview, and ways of life. Please see text below for further discussion and project context. ReLocate is a collaborative initiative that develops venues for listening, solidarity, and engagement with communities in Northwestern Alaska. Here sea levels are rising and permafrost is melting, entire villages risk falling into the sea. Isolated communities of around 400 people are facing imminent relocation and the need for viable futures is urgent. Until recently, material practices, notions of identity and ways of life were intimately linked to place, independence, and tradition. Today, Native Alaskan political history has determined the emergence of corporate and governmental agencies as cultural stakeholders. The conquest of consumerism and the fading of traditional knowledge force a growing dependence on products and routines of the cash economy. This sociopolitical context is tangibly reflected in the character of the built environment and material culture: locality continues to wash away with the rising tides of standardization and outside ideals. With an estimated quarter of the world’s undiscovered energy resources, disputes over tribal sovereignty, strongholds of indigenous practices and knowledge, and one of the most dramatically changing climates on Earth, the North faces significant economic, social , and political speculation. There is a need to address the future with urgency and sensitivity but there is little evidence of a holistic vision beyond economic efficiency and expediency. In Alaska, existing relocation plans from the Army Corps of Engineers are limited to a study of material logistics, engineering in response to site conditions, land ownership, and siting demands related to subsistence practices. Planning efforts have failed to include an interdisciplinary dialog about alternatives that includes participants from the social arts and sciences and supports community leadership. Proposed construction is standardized and expensive. For Kivalina, a village of about 400 people, estimates range between 200 to 400 million dollars. Funding is short and efforts have stalled. ReLocate builds online and face to face venues for solidarity and engagement between community members from the relocating villages of Kivalina and Shishmaref, visiting social artists and scientists, governmental and corporate stakeholders, and a global network of empathetic collaborators. These are persistent, community activated, evolving venues collaboratively imagined to locate: the social, political, and environmental context of issues surrounding village futures, opportunities for non-governmental partnerships, information sharing venues for the amplification of individual and consensual village voices, and a sense of locality defined by local notions of identity, worldview, and ways of life. We are in pursuit of opportunities that can support locally specific and independent village futures. Subsequent platforms, supported by the ADF and its partners, will be for the response to these opportunities through collaboration, education, and design. ReLocate participants, working with communities and each other, toward the design and introduction of these venues are: the artists group Wochenklausur, Civic Media Specialists, Alaskan anthropologist Ann Fienup-Riordan, and Finnish architectural theorist Juhani Pallasmaa. Compensation will include airfare, housing, project costs, food, and a $4,500 honorarium.